The RocketRAID 2640X1 is high-performance SAS RAID solutions, delivering reliability to demanding data-intensive applications such as tiered storage environments (disk-to-disk backup), security and surveillance, video editing, and digital content creation. 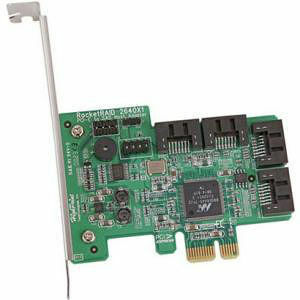 Support for both SAS and SATA 3Gb/s drives on the same controller maintains configuration optimization for performance based on the characteristics of SAS and SATA drives available today. HighPoint RAID Management software offers a user friendly interface to create, manage and maintain your storage solutions. Email notification and remote are some of the advance features that the RAID Management software has to offer. HighPoint offers the broadest range of support for all major operating systems to ensure OS and hardware server compatibility. Drivers are available for all major operating systems, including Windows , Linux, Mac OS X and FreeBSD. Linux Open Source driver help customers easily install and configure the RocketRAID 2640X1 controller.